In a very large working bowl combine the ground chuck and the sausage and blend the two with your hands. Add the bread that has been moistened with sprinkling of milk. Add in all of the rest of the ingredients in the order listed. Add a little water to the whole mixture and a few shakes of olive oil. My mother-in-law always added fennel seed to her meatballs. She thought it was great for Italian Sausage, it should be good for meatballs —- and it is… my family loves them that way. Try it. Preheat oven to 400 degrees. 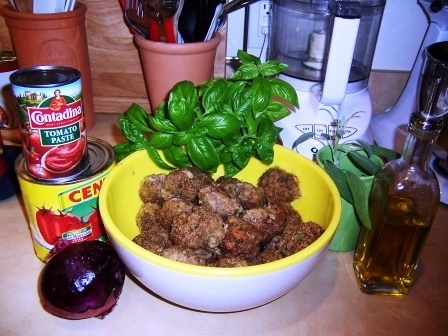 Roll the meatballs and put them in baking dishes and add a little water to the dishes before putting them into the oven. Bake for 20-25 minutes or until the meat is fully cooked. They will cook some more when you add them to your sauce pot later.